Can I Change my Office Chat plan anytime? You are here: Home / Billing / Can I Change my Office Chat plan anytime? Yes, Office Chat allows you to change/update your Office Chat plans to Enterprise, Business or Startup plan at any point in time. Use a web browser to log into your Office Chat domain. Click on the “Billing” from the left navigation then ‘Plans’. 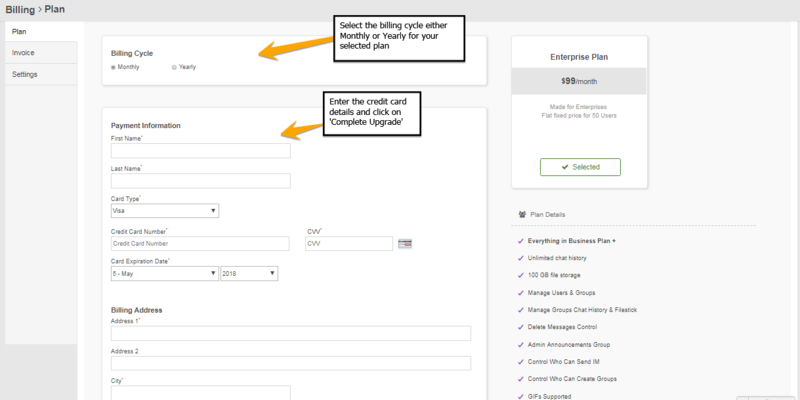 Select the billing cycle either ‘Monthly’ or ‘Yearly’ for your selected plan. Enter your Credit card details and Billing address and click on ‘Complete Upgrade’.